I believe (tell me if I'm wrong) I have given more attention to the Tom Ford Private Blends than any other contributor here at Now Smell This (and I've liked more of the Private Blend perfumes than my cohorts, too). But over the last couple of years, my interest in the brand has waned, as one overpriced, under-thought-out perfume after another joined the range. Tom Ford's Private Blend Atelier d’Orient Collection has been out 18 months and I've just sampled all four fragrances; three were yawners to me, but Fleur de Chine1 was a happy surprise. Fleur de Chine opens with a brash salvo of aldehydes, floral spice (very wisteria-like), tart citrus, and semi-indolic magnolia (this is not magnolia grandiflora but magnolia stellata, which has a sweeter, more jasmine-like aroma, with a hint of “spring chill” about it). Fleur de Chine’s heart notes smell of ‘demure’ roses (almost soapy in character) and strange fruit (ripe plum crossed with unripe peach). The stone fruit notes don’t smell of jam, but of “steeped” fruit, as if ripe peels and flesh were warming in a tea infusion. (Fleur de Chine’s tea note is subtle.) An interesting fragrance note guides Fleur de Chine to its conclusion: the aroma of bouquets of dried peony blossoms, with their brittle bitterness mixing with their sweet floral “past” of once-fresh flowers. I like Fleur de Chine; it’s one of the more interesting Private Blend fragrances. It has a vintage vibe, reminding me of old-style talcs, soaps, and lotions, as well as perfume. It’s very feminine to my nose, and I won't be wearing it myself (though I'd love it as a soap). When I sprayed Fleur de Chine on my skin, its vibrancy faded quickly, beginning with the arrival of the heart notes. The exciting, bold opening lasted for at least two days on my jacket sleeve, which only received one spritz of perfume. All the interesting twists and turns of Fleur de Chine on skin can be experienced in two ways: spray normally and keep nose close to skin for an hour…or spray lavishly — seven, eight, ten sprays. When sprayed liberally on skin, the fragrance’s many facets are more readily apparent. Fleur de Chine has good lasting power (when applied with a generous hand), but its sillage is mild. Tom Ford Fleur de Chine Eau de Parfum is available in 50 ml ($215) and 250 ml ($525). For buying information, see the listing for Tom Ford under Perfume Houses. 1. Perfumer Rodrigo Flores-Roux; listed fragrance notes of clementine, bergamot, star magnolia, champaca, jasmine, hyacinth, rose, wisteria, tea, plum, white peach, cedar, amber, styrax, vetiver. 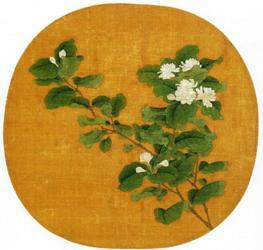 Note: top image is Branch of Flowering White Jasmine, attributed to early 12th century Chinese artist Zhao Chang, via Wikimedia Commons. OK, now I need to try this one! So far I’ve avoided the Private Blends due to the price, but Victoria at BdJ recently awarded Fleur de Chine 5 stars. If you like it too, it must be something special! I have tried most of his less expensive line, and in fact am the happy owner of FBs of Violet Blonde and Sahara Noir. bastet: many people prefer the non-Private Blend perfumes…Robin here at NST for one. So far I’ve only tried Plum Japonais from the FdO collection and found it pretty but fleeting, but I’ll be adding Fleur de Chine to the list of samples to try as well thanks to your review, Kevin. Though it is a disappointment that the sillage and lasting power aren’t that great for the price. If I’m going to drop over $200 on a perfume, it needs to have sillage and last long enough to make me feel like I got my money’s worth. Really, I haven’t tried many Private Blends either, though did just try and really like Noir de Noir last night. It was just a dab on the back of my hand, but I do hope that one has strength and tenacity since it did go straight to the “probably buy” list. And your review for Purple Patchouli makes me wish it wasn’t discontinued, too. It sounds wonderful! AbScent: yes, Purple Patchouli smelled like nothing else. I’ve liked the “darker” (woody/musky/oud-y) Private Blends…some of the citrus-focused ones are “nice”…but in no way worth the price. I don’t even like most patch heavy scents and liked PP. Sad. I got a dark, earthy, violet in PP. Don’t see violet listed but it’s in there, isn’t it? Omega: it’s got to be…I drained all my samples long ago. I was reading the review that Victoria posted on Bois De Jasmin recently, and I was commenting that I’m most impressed by the Atelier D’Orient collection among all Private Blends. The only way I manage to describe the collection (and Fleur De Chine in particular) is “sumptuous” They are rich, retro, elegant perfumes, in my opinion a real stand-out. I think FdC is spectacular, but I like the others too, perhaps the Plum one less. Rive D’Ambre is glorious, and while probably it does not add much to the amber conversation, it is so dense and lush… This collection is probably my favourite of the entire line! lupo: I liked Rive d’Ambre too…but it disappeared almost as soon as it hit my skin. I was lucky enough to get a sample last week, and I really loved it. I’m not a fan of most new perfumes that try to do vintage, because it’s really hard to pull off, but the aldehydes along with the spice really made it bubble, and it must have been the wisteria that gave it a slight lemony and at times orange blossom quality. I can see the problem with it’s very slight lasting power, although I bet this might be perfect in the spring and summer. I wanted to compare it to Shanghai Lily which also has a very vintage scent, but one which I found less successful. imapirate: true about the seasonal thing…I wore this on chilly and COLD days. I haven’t tried this one, but your review makes me want to. I like Shanghai Lily from this collection. I also tried Plum Japonais, but I found it similar to Feminite du Bois, which I also thought was better (and less expensive). I also got kind of a chemical note from PJ that detracted for me. Wandering further afield, I was able to try some Feminite du Bois recently, and ow! lots of cumin. That was a surprise; no one had talked about its being a sweaty perfume. AA: I don’t remember tons of cumin, but it’s been awhile. I got a sample bottle last week at Bloomingdales. It is “nice.” Low sillage, low staying power. I also found that with Tom Ford’s Neroli Portofino which I purchased last summer. I do like the lightness and staying power of Violet Blonde that I also purchased for summer a few years ago, but I hear it’s being discontinued. I’d rather invest in an Amouage or Vero Profumo fragrance. Lia: Neroli Portofino did last all day on me, but again…I sprayed and sprayed and sprayed! HA! I am willing to try anything that has TF’s name on it. His fragrances are like an acquired taste; you either love it or hate it. Can’t wait to try this one. But, Santal Blush still remains my favorite. Exquisite! SFA: Santal Blush is in my top five TF perfumes for sure. Kevin… I feel the same way about Velvet Gardenia That you do about Purple Patchouli! WHY IN THE NAME OF THE GODS Did TF Discontinue that one!?!?! It Astonishes Me! That, Tobacco Vanille, Champaca Absolute and Santal Blush are my Flat Out Favorites! TNK…ah,yes…Velvet Gardenia had so many fans! I’ve been trying to ignore TF. There are just too many; the few I have tried weren’t quite right, or maybe not right at all; and some of the best disappeared. Nonetheless, it sounds like I owe it to myself to give this one a try. Noz…the line needs a good weeding out. Kevin! I am SO happy you did a review on this gorgeous fragrance! When everybody raved about Shanghai Lily, I felt like the odd one out preferring Fleur de Chine and absolutely adoring it. I think it is a versatile fragrance. You can use it to step up your game/ outfit on a daily basis or complement you on more grand occasions. I initially bought the 50ml but I just had to grab the huge 250ml decanter. Now there is only one wish. Mr. Ford needs to KEEP THIS creation and not eliminate it, a habit which he has and dare I say killed off some beautiful fragrances! Fingers crossed! Sigh… will have to try this again now, lol! Shanghai Lily which apparently smells so good on others is truly awful on me and while I liked Plum Japonais I find it too stuffy in the dry down. Have you tried the new Patchouli one yet? This ones discontinued now. – so hurry up if ya wanna try it !